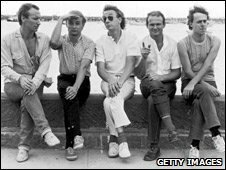 Men at Work's Colin Hay has issued an angry statement calling the Down Under plagiarism case "opportunistic greed". Larrikin Music had claimed Down Under's famous flute riff was stolen from the Girl Guides song, Kookabura, written by Marion Sinclair in 1934. But Hay, who co-wrote the track in 1978 with Ron Strykert, hit out at Justice Peter Jacobson's ruling - which could see Larrikin Music take up to 60% of Down Under's earning from the song. "It is no surprise that in more than 20 years, no one noticed the reference to Kookaburra," Hay said, in his statement. "It was inadvertent, naive, unconscious... by the time Men At Work had recorded the song, it had become unrecognisable." "It may well be noted, that Marion Sinclair herself never made any claim that we had appropriated any part of her song Kookabura... Apparently Marion Sinclair didn't notice either." Mr Lurie told Melbourne newspaper The Age: "Of course it would be disingenuous for me to say that there wasn't a financial aspect involved, [but] you could just as easily say what has won out today is the importance of checking before using other people's copyrights." A costs hearing will take place in late February, with Larrikin seeking 40%-60% of earnings from songwriters Hay and Strykert and record companies Sony BMG Music Entertainment and EMI Songs Australia. A number one in Australia, the US and the UK, the song tells the story of an Australian backpacker touring the world and famously referenced beer, chunder and Vegemite sandwiches. In his statement, Hay states that the flute riff was not added until 1979 when new band member "unconsciously referenced two bars of Kookaburra on the flute during live shows... and it did end up in the Men At Work recording". "What's interesting to me, is that Mr Lurie is making a claim to share in the copyright of a song, namely Down Under, which was created and existed for at least a year before Men At Work recorded it," continued Hay. "When I co-wrote Down Under back in 1978, I appropriated nothing from anyone else's song. "There was no Men At Work, there was no flute, yet the song existed. That's the truth of it, because I was there, Norm Lurie was not, and neither was Justice Jacobson," wrote an emotional Hay. Hay and publisher EMI are reported to be considering their next step in the legal battle. "It's earned a hell of a lot of money for us since we've bought it,'' Mr Lurie told The Age.